This is my last post on this, I promise! I love them all so far – very boring to say, I know – but I really do. If I’m really honest I had my fingers crossed for a beauty powder in my goody bag and didn’t really think the magically cool powder would be one for me. But having had a chance to try it out, I’m completely infatuated with the powder. It’s so baffling how it somehow manages to be a powder AND a liquid. It honestly feels like it’s some sort of magical cool liquid when applied to the skin. I used my elf brush to apply it and you dip the bush and it looks wet. Very bizarre when it looks like a powder but then turns wet… the mind boggles. 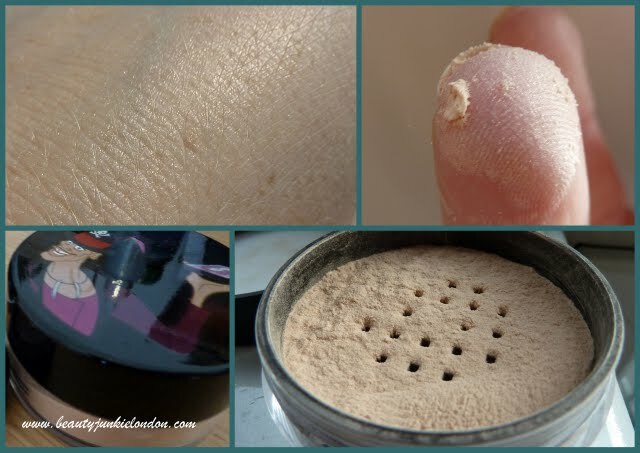 Applied, it somehow manages to be the perfect balance between a powder and a liquid. It seems to melt with the skin and create a smooth, iridescent glow – not shimmery like a Mineralise Skin Finish. Definitely more ‘glowy’. I think this is ideal for a healthy glow in the day time rather than other more shimmery or glittery product. You have to try it to know what I mean – it feels bizarre. But fabulous. The eyeshadow, Vainglorious is very very pretty and wearable. I’ve worn it both from daytime and night so far – it’s a warm brown, shade with a bit of purple and a hint of red. It’s a frost, so it has a sheen – but again, not too shimmery or glittery. It’s well pigmented and I like it as an all over the lid colour. I used it in the day with a bit of Virgin from the Urban Decay Naked Palette and loved the combo – it really softened it for daytime. I’m very happy with the bits I bought on the night. 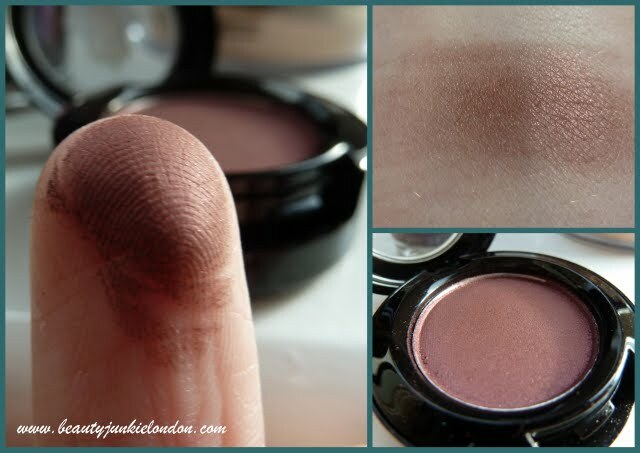 I am tempted to go and buy the ‘French Quarter’ Greasepaint stick when the collection launches properly on Thursday. Mostly just for the name as I will always have a soft spot for anything New Orleans related. So what do you think? Do you have your eye on anything from the collection? Bought by myself other than the magically cool powder as stated. Love the sound of the powder – I wasn’t sure if I’d go and look at the collection as I wasn’t convinced by it. But may go and check it out the powder. Those nail varnishes look absolutely incredible! I love the purple and teal. I am sure it is actual witchcraft! 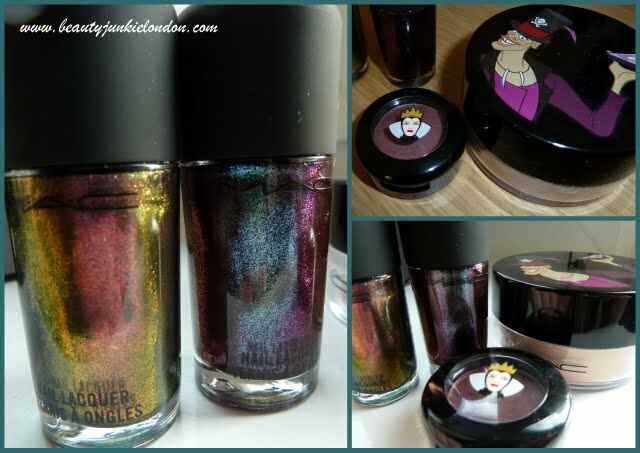 Oh I love this collection, especially the Maleficent part! In Holland / Belgium the collection will be launched this saturday! I fear I’ll be unable to get my hands on the products I really want. Most of what I was hoping to get sold out online within a few hours and I won’t be able to get to a MAC store until next monday! Boo! I ordered a ton and can’t wait for them to turn up! So excited about this range. Unfortunately I didn’t get the Magically cool powder as I’d spent all my money on the other stuff so I’m massively jealous. I’m hoping by some miracle they’ve still got some left when I get paid but I won’t hold my breath! The eye shadow is so pretty. Love that color!